It’s the World’s fastest Toyota Prius… Born out of Toyota’s promise to deliver a demonstration of its status as a world leader in the field of hybrid technology, it’s the second petrol-electric racer the company has launched. Lining up alongside the TS030 Hybrid, Toyota’s first Le Mans 24 Hour endurance racer since the legendary GT-One entered in the 1999 event, this radical GT300 specification Prius debuted in Japan, in last year’s 2012 Super GT series. 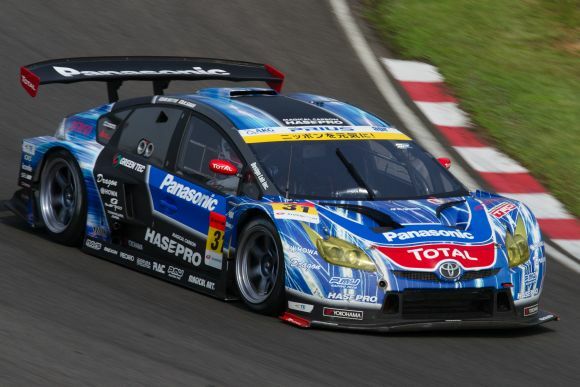 It’s set to hit the track again this weekend at the Okayama Circuit in the south of Japan (April 7th, 2013). The racer is designed to better the outright performance and handling of traditional GT300 competitors such as the Audi R8, BMW Z4, Lamborghini Gallardo, McLaren MP4, Mercedes-Benz SLS, Porsche 911, and Nissan GT-R.
Every element of the outer bodywork is custom-made in carbon fibre, though Toyota and team partner APR Racing have been careful to retain the distinctive Prius profile and styling cues. Whole sections of bodywork are secured to the inner steel shell with quick-release fasteners, providing access to vital mechanical elements. But a Prius wouldn’t be a Prius without a hybrid powerplant, and this GT300 car is no exception to that rule. Amazingly, it still makes use of the original Hybrid Synergy Drive system, though relocated to the passenger footwell for better weight distribution and connected to a slightly larger lithium-ion battery from the Prius+ MPV. Unlike the standard car, however, the electric motor is not attached to a 1.8-litre Atkinson cycle engine and there is no point looking under the bonnet, because you’ll find nothing there either. Instead this car now runs a 3.4-litre V8 race engine mounted between the B-pillars and rear axle, delivering torque to the rear wheels via a sequential manual gearbox. 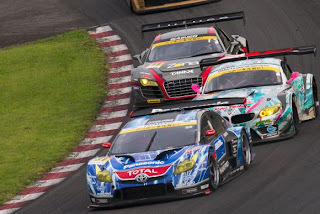 It is the same RV8K engine used in Toyota’s Formula Nippon, GT500, and LMP1 competitors, albeit de-tuned from its original 600PS output to meet GT300 regulations. Capping the combined output to 300PS is what allows for such a fascinating variety of car, engine and chassis combinations within this class. The standard Prius is designed to slip through the air with minimal disturbance. 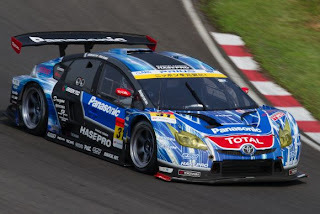 But the low-slung racing Prius uses aerodynamics such as a dry carbon front splitter, rear diffuser and high-level rear wing with Gurney flap to generate drag and adhesion to the track surface, especially around high-speed corners. The widened arches have also been formed with ducting to direct passing air through the wheel wells to cool the brakes.